Eighty years after it first opened, the landmark building blends old and new as heritage meets the digital age. 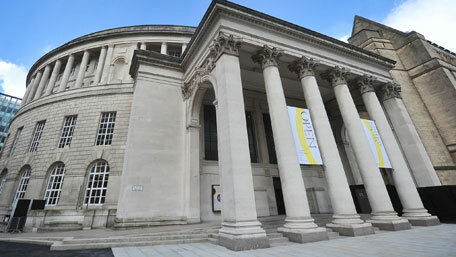 The transformed Central Library, the second largest public library in the UK, aims to be a major cultural destination and attract two million visitors a year. The library is host to a new Media Lounge, equipped with Apple Mac computers with creative software for would-be filmmakers, designers and gamers. Central Library offers superfast broadband throughout and has almost 200 computers for public use. The Archives+ Centre brings together the City's archives under one roof. It includes the North West’s first BFI Mediatheque where visitors can enjoy film and TV for free, including a special collection devoted to Manchester and the region on film. The Children's Library, is a 'Secret Garden' waiting to be discovered. Themed on the classic book by local author Frances Hodgson Burnett, it has been transformed to create an exciting hive of activity for children to enjoy. Digital interactive screens and interactive floor projections are some of the new technologies being used to entice a younger audience into the library. The Business Library is one of only six Business and Intellectual Property Centres in England, and a place where would-be inventors and entrepreneurs can access a wealth of information and one-to-one support from business advisers and patent attorneys. City Library, a new lending library on the lower ground floor providing an extra 2,000 sq metres of library space. Archive+ will change the way people use and intepret their local heritage. Interactive terminals have been incorporated to broaden the appeal of accessing local and family history in a participatory and interactive way. There's a ghostly guided tour with the library's first library manager, and basement level exhibition space. You can see more information about the design and consultancy undertaken by Mather & Co for Archive+ via the Design Week link on the right. While work was going on above ground, the task of storing and looking after the library's vast collection of books, manuscripts and archives, many in deep store in Cheshire's salt mines, was in the hands of library and archive relocation specialists. The enormous task of sequentially packing, moving, storing and relocating Manchester's collection of over one million books was undertaken by Harrow Green, who have produced a case study of the move process. The case study can be accessed via the link on the right. Manchester Evening News reports on the new look and provides a gallery of images. Link to the Guardian's coverage. Report, photos and interviews on the Design Week website.